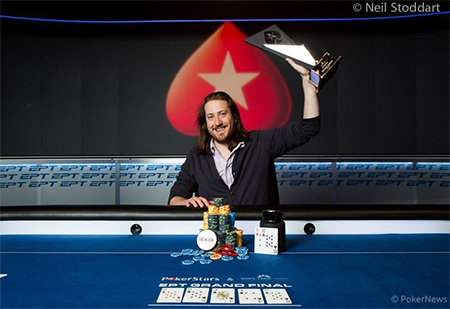 Last Sunday Steve O’Dwyer won the PokerStars and Monte-Carlo Casino European Poker Tour Final and collected €1,224,000 prize money. O’Dwyer had to beat a field of 531 players to take the prize as well as one of the toughest final tables in EPT history. Steve O’Dwyer took home €1,224,000 after beating a field of 531 players. As well as O’Dwyer the table consisted of Andrew Pantling, Johnny Lodden, Daniel Negreanu, Jake Cody, Noah Schwartz, Jason Mercier and Grant Levy. Slowly but surely the players where whittled down until there was just Pantling left. Pantling began with a slight chip lead and the lead went back and forth many times. After the dinner break O’Dwyer had a 9.2 to 6.7 million chip lead. O’Dwyer immediately extended his lead by winning a massive pot. In the tournament’s final hand O’Dwyer raised to 240,000 with a ten-eight off suit and Pantling called from the big blind with king-five o spades. The flop produced two eights, but also two spades with gave Pantling a flush draw. The turn brought the four of spades which gave Pantling a flush. Pantling check raised to 1,425,000 chips and O’Dwyer went all in. Amazingly the eight of clubs hit the river giving O’Dwyer four of a kind and the tournament. Pantling went home with €842,000.